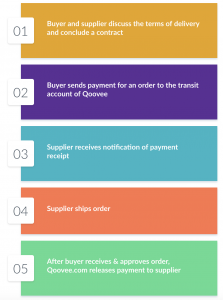 Qoovee Safe – protection of deals between suppliers and buyers worldwide, so they can trust each other and solve problems in a case of any dispute regarding payments, delivery and product quality. How does Qoovee guarantee safe deals? When and in which cases the “Deal Protection” service is required? QOOVEE.COM is a global ecommerce platform for business. A meeting place for suppliers and buyers. We are working with hundreds of thousands of suppliers and buyers of products and services from more than 80 countries.